August bank holiday is rife with festivals and celebrations, whether you spent your weekend in a poorly pitched tent at Reading or Leeds, or dancing the weekend away at Notting Hill carnival, you’ll probably be feeling a little worse for wear and tender for the next couple of days. Well do not fear! Because Anatomicals have come up with a fabulous idea to rescue those tired eyes just in time for your 9 o clock start at work tomorrow. 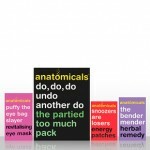 Anatomicals The Partied Too Much Pack is an ingenious little kit that has thought of everything you need to get you back to your normal sprightly self. The ‘bender mender’, herbal remedy has been invented by a widely regarded Russian doctor, already known in her homeland for perfecting a similar formula for the Russian navy, a group renowned for sinking a lot more than a few ships. The active ingredients will soon stop your head pounding, end your nausea and settle your stomach. Frequent festival goers will know its absolutely impossible to get your 8 hours shut eye at a festival. That’s where ‘snoozers are losers’ energy patches come in. These caffeine packed energy patches will have you back in the world of the living quicksnap. Last but certainly not least is ‘puffy the eye bag slayer’ revitalising eye mask. which will vanquish those puffy tired eyes and leave them cool and refreshed. All of these hangover cures will have you clear headed and thinking ‘never again’ in no time…well until lunch at least. The ‘Partied Too Much’ pack is priced at £7.75 and is available from ASOS.